Wisdom teeth can often pose a problem for patients who do not have enough room in their mouths for them to come in. Unfortunately, as you begin to age and the longer wisdom teeth are left in the gums, the bigger they become, and the more problems could arise if they are removed. For this reason, a coronectomy is a viable option for relieving wisdom tooth-related problems. A Coronectomy is the removal of only the crown, or top portion of a particular tooth, typically a wisdom tooth that is below the gums. Over time, wisdom teeth begin to get larger and the roots can grow down into the alveolar nerves in the face. If these nerves are touched during the surgical procedure to remove the entire tooth, complications, and pain can arise. For this reason, a Coronectomy only removes the crown or top of the wisdom tooth, leaving the roots in place and preventing the likelihood of that nerve being touched. 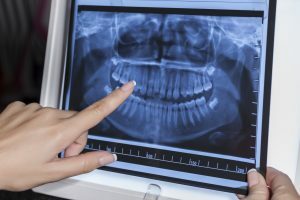 X-rays and imaging have shown that the roots of your wisdom teeth are near nerves. Because of this close interaction with the nerves, severe pain or complications could arise. If you want to inquire more about a Coronectomy, contact us today and one of our helpful staff members will be happy to assist you!